1Emeritus, Australian Graduate School of Urbanism, Faculty of Built Environment, University of New South Wales, South Wales, Australia. 2Associate Professor, Department of Geography, Faculty of Social Sciences, Payame Noor University, Tehran, Iran. Purpose: The current paper aimed at developing a transport need index to measure the needs of transport disadvantaged groups in rural areas of New South Wales (NSW), Australia. This transport supply index, in turn, assesses the provision of transport services in these areas. Methods: We adopted the index methods developed for Australian metropolitan areas to reﬂect the extent of the rural transport problem, the range of social needs groups of the rural areas, and the specialized types of services used in rural areas. A geographical information system is used to quantify the index values, assess transport needs and the spatial distribution of identified gaps between the levels of service supply. Results: The results of the current study highlighted that transport needs were spatially distributed across rural areas, but concentrated in certain coastal and inland areas, particularly the North-Western parts of NSW. These areas had very poor public transport options that were not likely to be improved without targeted community transport type projects and provisions of social services. Conclusion: The developed indexes present a quantitative basis on which the extent of transport need and transport supply in an area can be compared with other areas. They are a robust mechanism for government and non-government agencies to address community needs in rural NSW through specialised transportation services, and allocate appropriate funding levels in a consistent and equitable manner. The ready availability of census data and other transport level of service data facilitate the application of this approach. A number of recent Australian studies measuring the quality of public transport supply with respect to transport disadvantage primarily focus on metropolitan areas (Currie & Wallis, 1992; Currie, 2004; Currie, 2010; Dodson, Gleeson, & Snipe, 2004; Hurni, 2005). However, lack of public transport and access is just as likely to be a significant need in rural areas, both in its severity and prevalence, as in Australia’s urban fringe. Rural areas in Australia experience transport and accessibility problems very similar to other wealthy countries with low rural densities and long distances such as the US and Canada – little or no public transport, very high levels of car ownership, and poor service provision generally (Nutley, 2003). This situation is exacerbated by public sector service rationalisation over the past 20 years, which has necessitated longer distance travel for many rural residents (Parolin, 1996). The reduction of local services requires people to travel further to reach the remaining service locations (usually larger centres), and imposes extra costs on rural households (Smailes, 1996). In such a context, the importance of transport availability and the ability of disadvantaged groups to use transport become important issues for investigation. The provision of public transport to provide access for socially disadvantaged groups in rural areas is now well embraced throughout the world, especially in the United Kingdom (UK) with the establishment of the Social Exclusion Unit, and the development of processes of accessibility planning at the local level (Battellino, 2009). While public transport services for the transport disadvantaged groups are also provided in rural NSW, the range of policy responses is less well developed and more focused on subsidised services provided by a range of governmental and non-governmental agencies referred to as ‘community transport’ services targeted at the eligible frail aged (over 65 years) and younger people (under 65 years) with a disability (Battellino, 2009). A second type of ‘community transport’ service is the community development model implemented using regional transport coordinators across the state who involve the community to identify transport needs and solutions. Despite the attempts by governmental and non-governmental agencies to address community needs in NSW through specialised public transport services, there are no quantitative studies to assess if the provided services meet the needs of the community, or measure and determine the extent of transport disadvantage in an area; therefore, it cannot be compared with other areas. This raises questions about spatial equity in the distribution of services geographically in rural areas, as services can be based more on the ability of the regional transport coordinator and on the ability of the community to access funding than on a ‘...rational assessment of the distribution of potential users in the community...’ (Currie, 2010). The current paper presented the results of a research study that developed a quantitative measure of transport need with respect to transport disadvantage in the rural areas of NSW. The conceptual and methodological developments of the recent metropolitan studies are drawn upon to further refine an approach suitable for rural areas, despite data limitations not experienced in urban areas. The aims of the approach are as follows: To develop an index of transport need that measures the spatial distribution of need; To assess the spatial distribution of public transport services, including community transport projects for the transport disadvantaged groups; and to identify needs gaps between the transport needs of a community and service provisions in an area. The next section of the current paper presents a summary of the research that developed measures of transport service quality relative to social needs. It is followed by a discussion of the methodology adopted for the study. Key findings for rural NSW are then presented. The paper concludes with a discussion of key findings and an assessment of the implications for service delivery for the transport disadvantaged groups in the rural areas of NSW. Over the past 20 years there have been several key reviews of quantitative approaches to measure transport needs and transport disadvantages. The reviews by Currie and Wallis (1992), Currie (2010), Nutley (2003), Parolin (1987) and Rostami (2003, 2005) described a range of indices of transport need developed and applied in the UK, US, and more recently in Australia. Interest in the development and application of methods to measure transport needs in the UK, in particular, stemmed from several factors. In the UK, in the 1970s, there was growing concern about the decline of public transport services in rural areas and the role of government intervention in the financing and planning of such services. The resulting UK measures generally aimed at determining the need for public transport services in rural areas are concerned with broader populations of the transport disadvantaged, and some involve extremely detailed information such as facilities available, and the number of visits to those facilities, and car availability for individual trip purposes and times (Parolin, 1987). 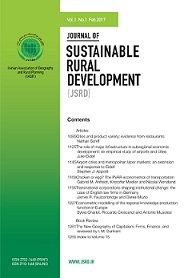 In North America, on the other hand, interest in need assessment methodologies was initially a function of development and implementation of public transportation systems in rural areas. Nationwide non‑metropolitan implementation programs were stimulated by the availability of federal funds to support such services following increased recognition of severe mobility deficiencies in rural areas (Dodson et al., 2004). Parolin (1987) and Currie (2010) provided an overview of US studies that documented the dimensions of the rural transportation problem through application of various needs assessment methods, which established priorities based on transportation needs for areas. 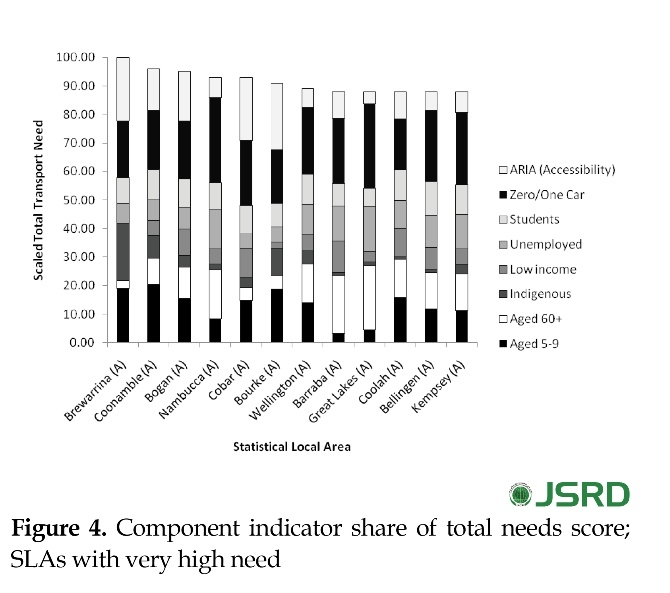 In general, the US transport need indicators aimed at determining needs for the transport disadvantaged groups, although some did include a broader population base. These indicators were limited in their consideration of the quality of existing public transport services provided, and therefore, focussed more on the mobility gaps (Currie, 2004; Parolin, 1987). However, the key factors in the methodologies used in the UK and USA are: A population measure, which values needs in relation to the size of the target population; Socioeconomic measures that consider the size and distribution of social groups in need of transport services, or likely to have problems with transport; Measures of transport supply that assess the relative availability of transport to the supplied services; and Measures of distance, cost, or accessibility to facilities and locations that help to identify where accessibility is poor. The transport needs studies conducted for Australian metropolitan areas used the above mentioned factors to develop both a needs indexation approach, and a transport supply index as part of the objective of quantifying spatial gaps in public transport supply based on social needs. For example, the study of transport needs in Adelaide (Currie & Wallis, 1992), the needs gap study of Hobart (Currie, 2004), and the transport needs gap study of Melbourne (Currie, 2010) adopted the following methodology: Use of census data and other social service data to identify and measure socially disadvantaged groups in a local area; for example, adults without cars, persons aged over 60 years, persons granting disability pension, low income adults, adults not in the labour force, students and children aged 5 to 9 years; Adoption of an accessibility measure to identify locational disadvantage. In some cases, straight line distance to the central business district is used and, in other cases, an access distance to public transport stops/stations is measured for each spatial unit based on the thresholds of typical walk catchments for various public transport modes; The socioeconomic and accessibility indicators are weighted according to the criteria developed from a trip rate analysis of residents from the Adelaide Household Travel Survey (Currie & Wallis, 1992). A composite needs score for each location is combined with the standardised socioeconomic and accessibility indicator to give each location a score between 0 and 100, when 100 is the location with the highest need; The approach to public transport supply measurement for each location is based on developing a single indicator. In the case of the Adelaide study (Currie & Wallis, 1992), the following approach was used: Developing a public transport supply measure based on the density of vehicle kilometers provided in the daytime inter-peak per square kilometer; Developing a community transport supply measure based on the number of community transport (or paratransit) vehicles supplied by area, and; and Developing a taxi usage scheme indicator that measures the number of persons in the community who use the taxi subsidy scheme. In the case of the Hobart and Melbourne studies (Currie, 2004; Currie, 2010), more refined measures of public transport supply were quantified that involved generalised costs for series of trip purposes or a density of service coverage indicator, respectively. The above mentioned approaches to transport supply can be used to generate single supply scores for each respective approach that range between 0 and 100, with the highest score representing the highest level of supply. The final stage involves identification of spatial needs gaps where needs scores are high, but supply scores are low. In contrast to the metropolitan area studies, only 1 study was publicly available that had developed an index of transport needs of the rural population in Australia (Nutley, 2003) (At least 1 other study was completed in the 1980s in NSW, but the reports for this study were no longer available.). The application of the Nutley (Nutley, 2003) index of transport needs used very limited mobility indicators, did not identify population subgroups, and used very large spatial units known as a Statistical Division (SD). The SD is level below the state, and it is possible that specific transport needs in respective zones can be diluted over a much wider area when using a large spatial unit (Parolin, 1987). Wallis (Currie & Wallis, 1992), and Currie (Currie, 2004; Currie, 2010) with an index of the quality of public transport supply in rural statistical local areas (SLAs) of NSW, also applying and evaluating the index of transport need developed by Nutley (2003). A key part of this approach was to identify relevant population subgroups and demographic variables for rural areas, and a detailed assessment of transport supply measurement that captured the range of services provided for and available to transport disadvantaged groups in rural NSW. The methodology to measure transport needs was adopted from Currie and Wallis (Currie & Wallis, 1992), and Currie (Currie, 2004; Currie, 2010) where various transport needs indicators associated with transport disadvantages were combined for each of the 139 rural (non-metropolitan) SLAs of NSW. Rural SLAs exclude those belonging to the 3 metropolitan areas in NSW as Sydney, Newcastle, and Wollongong; they also exclude the Australian Capital Territory (ACT), Canberra. However, consideration of transport needs in this analysis incorporated both rural and urban parts of each non-metropolitan SLA. 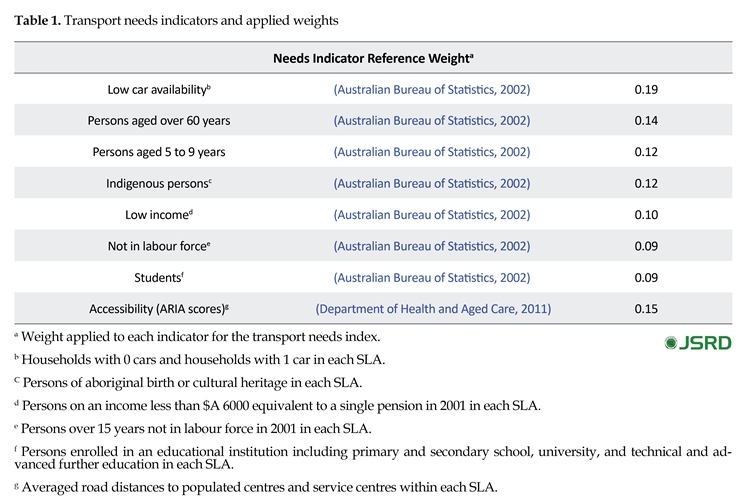 These transport needs indicators were used to define a single needs score for each SLA based on the relative indicator values. Geographic Information System (GIS) was used to assemble and visually analyse the results. where V0 is the percentage of households with no vehicle, V1 is the percentage of households with vehicle (to show the possibility that all members of the household have not enough access to the vehicle all the times), T is the percentage of journeys to work by public transport, A is a standardised accessibility/remoteness index available for localities (ARIA scores) and SLAs in Australia. This index (TN) combines both potential mobility indicators through the availability of transport resources and accessibility to service centres of thresholds with various sizes. It is a measure of whether people in a locality are able to get to specific locations, or have the facilities to obtain ‘needed’ goods and services. The 3 mobility indicators used in the index (percentage of households with no vehicle; percentage of households with vehicle, and; percentage of the journeys to work by public transport) were obtained from the 2001 census (Australian Bureau of Statistics, 2002). ARIA scores were not available from the census and were obtained from the Commonwealth Department of Health and Aged Care (Department of Health and Aged Care, 2011). They were included in the needs index, because needs were considered to vary with the distance to service centres. 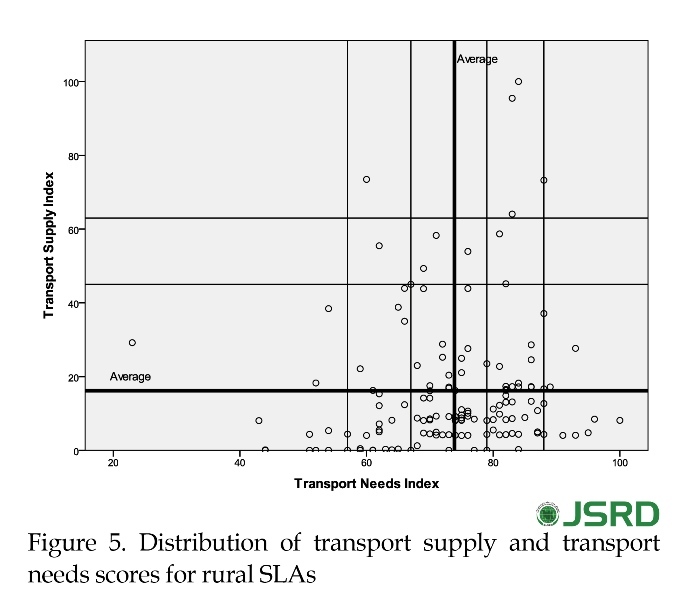 The specification and measurement of a transport needs index for rural SLAs in NSW involved identifying transport needs indicators appropriate for rural areas and deriving a needs score for each area based on the relative performance of individual indicators. Following the extensive consultation with community transport stakeholders in NSW, such as the Community Transport Organisation, Home and Community Care Program, and NSW Ministry of Transport (community transport section), and an assessment of the indicators used by Currie and Wallis (Currie & Wallis, 1992) and Currie (Currie, 2004; Currie, 2010), the transport needs indicators used in the analysis are shown in Table 1. Indigenous persons are not an indicator in the metropolitan studies, but are included in the analysis to reflect much higher percentage distributions of this group in rural areas, the likely need of Indigenous persons to travel longer distances to obtain services and that they are a highly dependent client group of the community transport projects (Battellino, 2009). One car households were added and combined with 0 car households (low car availability) to reflect that the vehicle may not be available for all adults in the household during the day and, therefore, to highlight the prevalence of further mobility problems in rural SLAs (Nutley, 2003). The low income indicator differed from the one used in the metropolitan area studies in which the focus was on very low income persons where social disadvantage is likely to be more pronounced and reflect a lower ability to pay for mainstream public transport services. Persons on a disability pension were not included in the analysis given the unavailability of this data to the authors; a problem not encountered in the metropolitan area study examples (Currie & Wallis, 1992; Currie, 2004; Currie, 2010). However, it is very likely that persons on a disability pension are counted in several indicators used in the analysis (e.g. low car availability, persons aged over 60, and low income). Accessibility is measured using ARIA scores; the lower the ARIA score, the higher the measured accessibility level of the SLA. The weights assigned to each indicator (Table 1) were based on the approaches of the metropolitan area studies (Currie & Wallis, 1992; Currie, 2004; Currie, 2010)and on outcomes of the stakeholder consultation process. It was not possible to derive weights based on trip rate analysis of transport disadvantaged groups, as in the metropolitan area studies, given the absence of relevant household travel surveys for rural areas of NSW. 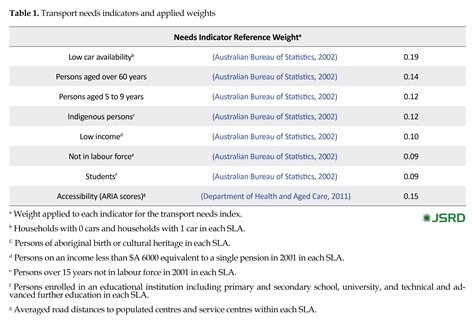 The relative weights accorded with the various factors affecting transport needs; but in the analysis, a higher weight was assigned to low car availability, the young and older age groups (5 to 9 years and over 60 years), indigenous persons, and accessibility to reflect greater importance of these indicators in rural SLAs in terms of severity and geographical distribution. 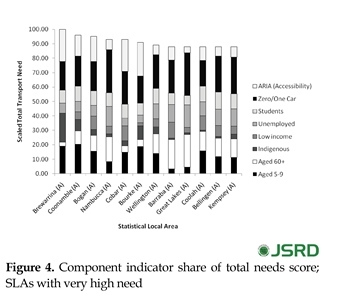 where SLA is the SLA under analysis, SNI1 is standardised needs indicator 1=low car availability, SNI2 is standardised needs indicator 2=persons aged over 60 years, SNI3 is standardised needs indicator 3=persons aged 5 to 9 years, SNI4 is standardised needs indicator 4=indigenous persons, SNI5 is standardised needs indicator 5=low income, SNI6 is standardised needs indicator 6=not in labour force, SNI7 is standardised needs indicator 7=students, SNI8 is standardised needs indicator 8=accessibility. W1 to W8 is the weight for indicator SNI1 to SNI8 from Table 1. As mentioned previously, a single needs score is calculated for each indicator in several steps. First, needs scores are standardised to a value between 0 and 100. Second, each standardised indicator is, then, weighted and summed together and a final transport needs index is generated (TNSSLA) and standardised to obtain final need scores between 0 and 100 for all SLAs in the analysis, where 100 is equivalent to the highest need. 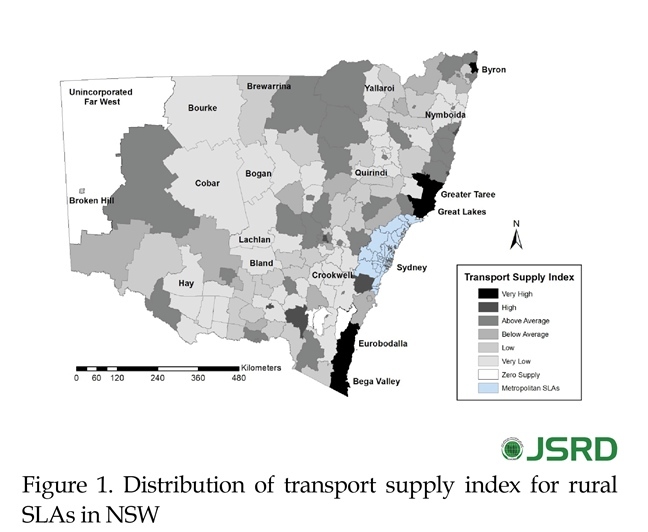 In the current analysis, transport supply was measured for each SLA to capture the range of transport services, and their level of service, available to the transport disadvantaged groups in the rural areas of NSW. The supply variables used in the current study were the level of service indicators for conventional public transport services, community transport services, and the subsidised taxi scheme. GIS was used to assemble and develop the level of service indicators and compute a measure of transport supply for each SLA. The following methodology was used: A GIS database of CountryLink rail, CountryLink bus, regional bus, and non-commercial school bus routes were obtained from NSW Transport Data Centre (now called NSW Bureau of Transport Statistics), June 2005. CountryLink rail services were provided by the State Rail Authority of NSW (State Rail). CountryLink bus coach services were contracted through State Rail to private coach operators to provide ‘rural coach services’ that involve coach/train connections and stand-alone regional coach services. Regional bus services were provided under contract to Transport NSW. Non-commercial school bus services are primarily for school children, but in more isolated rural communities that lack connections by more conventional public transport services, these services can be used by the transport disadvantaged groups to access a larger centre. In general, contracted bus coach services in rural NSW provide 3 types of services: local town, village-to-town, and town-to-town services. All rail and bus/coach services are heavily subsidised and most elderly, disabled, young, and unemployed persons, and those on other social service benefits, either travel free or on special discounted fares. GIS was used to overlay the above transport layers with the layer of SLAs to determine the length of service routes for each SLA. A database of the number of services and service frequencies for each respective service for each SLA was obtained from the NSW Government iPlan website, June 2005 (This website is no longer active.). The used measure of service frequency was the total number of service arrivals per week. For community transport services, the iPlan website provides the number of community transport projects in each SLA. Each project could be operating one or a contribution of several community transport services within an SLA such as a project minibus, project car, volunteer car, taxi, or private/public fixed route bus operators, etc. (Battellino, 2009). Where LSij is the level of service measure for transport servicei in SLAj, Iij is the length of route associated with transport servicei in SLAi, fi is the frequency of service per week for transport servicei, Aj is the area of SLAi in square Kilometres. A total of 6 levels of service indicators were calculated. Each LSij value was, then, weighted according to weights sourced from the Adelaide study by Currie and Wallis (Currie & Wallis, 1992), and then, standardised to a score between 0 and 100. In the present study, the weights were slightly modified to reflect the relative importance of the 6 services for social service clients in rural NSW based on consultation with stakeholders. The study allocated the following weights: 45% to conventional public transport services (15% CountryLink rail, 15% CountryLink bus, 10% regional services, and 5% school bus services), 50% to community transport, and 5% to wheelchair accessible subsidised taxi schemes. The low weight for the latter reflects the unavailability of the taxi scheme in many rural SLAs of NSW, and the low weight for school bus services reflects the low level of usage of such a service by social service clients. A final supply score for each SLA was generated by combining the 6 component transport level of service indicators and generating a standardised transport supply index value between 0 and 100. 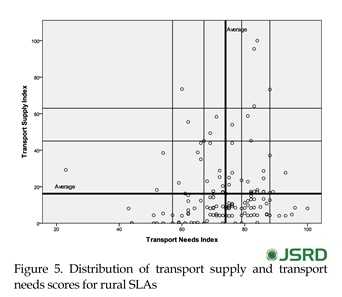 The assessment of spatial needs gaps between transport needs and transport supply was based on identifying SLAs, where the needs scores were high, but supply scores were low. large population base - Eurobodalla, Bega Valley, Great Lakes, Greater Taree, and Byron. In the next category of high transport supply, 1 SLA – Wingecaribbee – was located close to the coast on the edge of the Sydney metropolitan area. These 6 coastal SLAs were characterised by high scores on all 6 of the measured supply indicators and reflected significant increases in population that occurred in coastal areas of NSW over the past 20 years. Furthermore, these SLAs were also characterised by high frequencies of CountryLink bus and rail services as part of the provision of interstate services between Sydney and Brisbane, and Sydney and Melbourne, and they contained a large number of community transport projects and wheelchair accessible taxi subsidy scheme recipients. Other groupings of the above average transport supply scores occurred in patches across NSW and appeared to coincide with SLAs that had larger regional population centres. The transport supply index showed a significant correlation with population density (r=0.608, P<0.01). Those SLAs that were below average and had low and very low supply scores were predominantly found in the Southwest, Northwest, and Northeast areas of NSW. There was also a grouping of below average transport supply SLAs along the North coast (Pristine Waters, Ulmarra, and Maclean) and in the immediate coastal hinterland. Only 3 SLAs had no transport supply in terms of frequency of service. Further analysis showed that 64.7% of rural SLAs were below the average of the transport supply index. These were predominantly inland SLAs where population density was lower and provision of conventional public transport services was problematic due to lower potential patronage levels. Generally, these similar SLAs tend to have, at best, 1 community transport project and no taxi subsidy scheme. However, there were 22 SLAs with no community transport projects and 93 ones with no taxi subsidy scheme recipients during the data collection from 2003 to 2004. A total of 66 SLAs had no CountryLink rail service and 122 had no CountryLink bus service. Results of application of the Nutley (2003) index are mapped in Figure 2. There was a regular increase in index values with distance from coastal areas. Lowest needs were clustered in the immediate coastal rural hinterlands and hinterlands of the metropolitan areas. The Northern coast SLAs were under the influence of Brisbane, and the South-Western SLAs were influenced by Albury and Canberra. The high and very high needs SLAs were clustered in the North-Western part of NSW with high proportions of 0 car households. with the spatial distribution of index values when compared to the distribution of 0 and 1 car ownerships. For example, the far West of NSW, and Eurobodalla and Bega Valley on the South coast, had above average needs scores, but were the areas with low 0 car ownership levels. This anomaly suggested the need for a more appropriate weighting of indicators and additional indicators (demographic variables) to balance the effects of distance (ARIA scores) on needs scores. Figure 3 highlights the geographic distribution of transport needs index scores developed for rural areas of NSW. Higher needs are indicated by darker shading. In general, the distribution of needs categories was not clustered as in Figure 2, but was patchy by comparison. Needs scores were more dispersed and scattered across rural SLAs. However, there were some concentrations that stood out; i.e. concentrations of very high scores were evident along the Middle and North coast SLAs, North of the metropolitan region (Great Lakes, Kempsey, Nambucca, Bellingen, and Maclean). On the South coast (South of the metropolitan region), there were concentrations of high needs scores at Shoalhaven, Eurobodalla, Bega Valley, and Bombala. There was a large cluster of SLAs from the North coast up to the Queensland border that had high need scores. The main cluster of very high need was found in the Western SLAs of Bourke, Brewarrina, Cobar, and Bogan. Patches of very high need were also found at Coonamble, Coolah, Wellington, Barraba, and Gloucester. In general, lowest needs SLAs were clustered in the immediate coastal rural hinterlands and hinterlands of the metropolitan region, but some low needs SLAs were also found in the interior of NSW at Dubbo, Carrathool, and Wagga Wagga. The significant concentrations of transport needs scores identified from Figure 3 were, therefore, the coastal areas of high population growth and large parts of inland NSW that experienced population decline. However, the indicators that contributed to very high and high needs scores in coastal and inland SLAs may be quite different, and this information may be important to differentiated and targeted transport policy responses (Battellino, 2009; Kamruzzaman & Hine, 2011). The contribution of each indicator score to total transport need (scaled between 0 and 100) was calculated for the 12 very high transport need SLAs. Figure 4 shows the relative contribution of each indicator. In general, there were significant differences between coastal SLAs (Nambucca, Great Lakes, Bellingen, and Kempsey) and the ones in the Northwest in terms of the contribution of indicators to total transport needs. Very high need coastal SLAs owe a high proportion of their scores to high numbers of persons with low car ownership, persons aged 60 or over, and the unemployed. Accessibility did not appear to be a significant contributor to transport disadvantage in these coastal SLAs. The cluster of SLAs in the Northwest (Brewarrina, Cobar, Bogan, and Bourke) with very high needs scores had high scores due to being less accessible, having high concentrations of people with low levels of car ownership, and high concentrations of young people. In the case of Brewarrina, there were also very high concentrations of indigenous persons. These areas had low concentrations of persons aged 60 or over. Of the 3 remaining inland and Northwest patches of very high transport need, Barraba had a high proportion of scores due to persons aged 60, and low car ownership. The other 2 SLAs, Coonamble and Wellington, also owed a large part of their high needs scores to low car ownership and young persons. Although located in inland NSW, accessibility was not a significant contributor to total needs for these SLAs. Finally, it was significant to note that those SLAs identified in the very high and high transport needs categories showed strong overlap with areas identified as being socially disadvantaged on the index of social disadvantage developed by Vinson (2004). The index of social disadvantage was based on 13 disadvantaged indicators measured for postcode areas, a smaller spatial unit than the SLA (although in the central and western parts of NSW they share the same boundaries due to size). the same postcode category) found that: Eight out of 12 of the very high transport needs SLAs overlapped with postcodes with the highest level of social disadvantage. Four out of 12 of the very high transport needs SLAs overlapped with postcodes with the 2nd highest level of social disadvantage – degree of disadvantage. Eighteen out of 40 high need SLAs overlapped with postcodes with the highest level of social disadvantage. Sixteen out of 40 high need SLAs overlapped with postcodes with the 2nd highest level of social disadvantage – degree of disadvantage. The immediate conclusion from this high degree of overlap of the 2 indexes was that the same socioeconomic groups were affected by a combined set of disadvantaged circumstances, which suggested the need for policy interventions beyond what could be provided by transport authorities alone. Figure 5 shows the distribution of supply and need scores relative to the average of respective standardised scores. The distribution of points indicated no correlation between supply and need (r=0.113, P=0.185). On the supply index, the focus was on those points that were below average as they included those SLAs with low and very low transport supply values. Those SLAs that were above average on the needs index included the ones categorised as high need (score between 79 and 87) and very high need (score at 88 or above). Focus was on quadrant 1 – those SLAs that were above average in their transport needs and below average in their transport supply and, specifically, on the high and very high need categories. Figure 6 shows the spatial distribution of SLAs with very high and high transport needs scores with below average transport service levels. The following trends were suggested: 1) The 7 top areas of very high need and low supply were concentrated in the North-Central and North-Western part of NSW. 2) The rank ordering of very high need indicated that Brewarrina was the most transport needy SLA with very low supply; it was followed, in rank order, by Coonamble, Bogan, Cobar, Bourke, and Coolah/Barraba (equal rank). 3) The SLAs with the very lowest supply scores were (in rank order): Bourke, Cobar, Bogan, and Barraba. 4) The absence of very high need/low supply SLAs along the coast indicated that very high need SLAs on the Middle and North coasts indicated in Figure 3 were categorized as above average in terms of transport level of service. 5) The 23 SLAs categorized as high need/low supply showed a more patchy distribution, but with concentrations on the North coast and its hinterland, and in the interior of NSW – North, Central-West, and Southwest parts of NSW. 6) Broken Hill, Maclean, and Gloucester were ranked equally first among the high need/low supply SLAs. Pristine Waters – Ulmarra, the SLA just to the South of Maclean, has the lowest supply score among the high need SLAs. Further analysis of the very high need/low supply SLAs in terms of the component indicators of supply indicated that these SLAs had no passenger rail services, average just over 1 community transport project per SLA, and no wheelchair accessible taxi services (at the time of the study). Rail services were freight rail services, with CountryLink buses providing a minimal weekly service between larger centers and the closest passenger rail station. High need/low supply SLAs fared slightly better in terms of transport level of service; most were served by passenger rail and CountryLink bus services, each had at least 1 community transport project and several had a wheelchair accessible taxi subsidy scheme service. A key conclusion from the needs gap analysis was that the most needy and vulnerable rural SLAs in terms of transport disadvantage had poor levels of transport service. Conventional public transport services were not likely to see service improvements due to very low population densities. However, the very high and high transport needs identified in these SLAs required some form of public transport that addressed local community transport needs. Regional transport coordinators funded by NSW Ministry of Transport had the challenge of working with the local community to identify and address local needs through targeted projects. 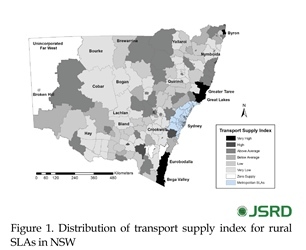 The current paper presented an approach to measurement and analysis of transport needs relative to levels of public transport supply in rural areas of NSW based on methods used in the metropolitan area studies. However, the developed indicator components of the transport needs index reflected the social needs profile of rural areas. Indicator components of the supply index reflected the availability of relevant longer distance public transport services and of community transport projects, and specialised services for the clients with disability. The data of the supply components were either frequency or length of route information that did not allow incorporating measures of level of service to activities or trip purposes as in the metropolitan studies. It was not likely that such datasets would be available in the future, given the metropolitan focus of travel survey data collection by NSW transport authorities. The results of the study highlighted that, unlike the metropolitan studies where transport disadvantage was predominantly a fringe area phenomenon, transport need occurred across rural areas, but was concentrated in certain coastal and inland areas, particularly the North-Western parts of NSW. These areas had very poor public transport options that were not likely to be improved without targeted community transport type projects. Further, these areas also coincided with areas of social disadvantage, which suggested that transport alone was not likely to solve the needs problem – there was a requirement for social services as well. Finally, the current paper presented a quantitative basis on which the extent of transport need and transport supply in an area can be compared with those of other areas. It is, therefore, a robust mechanism for governmental and non-governmental agencies to address community needs in rural NSW through specialised transportation services, and to allocate appropriate funding levels in a consistent and equitable manner. The availability of census data and other transport levels of service data facilitated application of this approach. Currie, G. (2004). Gap analysis of public transport needs: measuring spatial distribution of public transport needs and identifying gaps in the quality of public transport provision. Transportation research record: Journal of the Transportation Research Board, 1895, 137–146. doi: 10.3141/1895-18. Currie, G. (2010). Quantifying spatial gaps in public transport supply based on social needs. Journal of Transport Geography, 18(1), 31–41. doi: 10.1016/j.jtrangeo.2008.12.002. Nutley, S. (2003). Indicators of transport and accessibility problems in rural Australia. Journal of Transport Geography, 11(1), 55–71. doi: 10.1016/s0966-6923(02)00052-2. Parolin, B. (1996). Effects of rationalization of rural passenger services on travel activity patterns. Transportation research record: Journal of the Transportation Research Board, 1557, 48–57. doi: 10.3141/1557-08. Smailes, P. J. (1996). Accessibility changes in South Australia and the country town network. In G. Lawrence, K. Lyons, & S. Momtaz (Eds. ), Social Change in Rural Australia (pp. 119–138). Rockhampton: Central Queensland University. Battellino, H. (2009). Transport for the transport disadvantaged: A review of service delivery models in New South Wales. Transport Policy, 16(3), 123–129. doi: 10.1016/j.tranpol.2009.02.006. Parolin, B. P. (1987). A review of methods for measuring public transportation needs. Sydney: NSW Urban Transit Authority. Rostami, S. (2003). The necessity of measuring transport needs in rural Australia. In J. Gao, R. Le Heron, & J. Logie. (Eds. ), Windows on a Changing World: New Zealand Geographical Society 22nd Conference (pp. 262-265). Auckland, New Zealand. Rostami, S. (2005). Application of the transport needs concept to rural New South Wales: A GIS Based approach [PhD thesis]. Sydney: University of New South Wales.